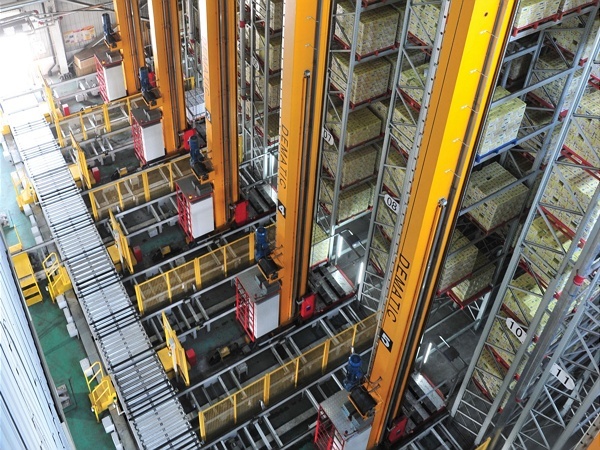 Dematic, a leading provider of a comprehensive range of intelligent intralogistics and materials handling solutions, has developed a new, pallet automated storage and retrieval system (ASRS) for fast moving consumer goods (FMCG) and food and beverage manufacturers handling high volumes of palletised stock. With retailers streamlining their supply chains in recent years, manufacturers of food, beverage and FMCG are facing growing need to carry higher volumes of stock and to optimise storage space efficiency. Dematic’s fully integrated RapidStore Pallet ASRS can be tailored to the user’s precise storage and handling requirements and enables fast, cost-efficient pallet handling. According to the media release by Dematic, the RapidShare crane is ideal for bulk reserve storage in fast-moving pallet handling operations and provides significantly faster cycle times than manually operated forklifts. Its ability to operate 24/7 with minimal timeline provides users with greatly reduced labour and operating costs, as well as an excellent return on investment. In addition, the RapidStore crane also requires a much smaller building footprint to house the same number of pallets when compared to conventional storage systems, substantially reducing associated land, building and/or leasing costs. Dematic’s RapidStore UL1200 crane provides safe and efficient high speed handling of pallets weighing up to 1200 kg to 30 m high at speeds of up to 4 m/s. Dematic also offers an extensive range of pallet in-feed and out-feed stations to suit customer requirements. From low cost, fixed-position pick-up and deposit (P&D) stations through to integrated pallet conveyors, transfer cars and monorail systems, Dematic can provide a range of high performance solutions to transfer goods in and out of the pallet ASRS, seamlessly integrating receiving, manufacturing, quality control, put-away, palletising and dispatch. Dematic’s Location Control Software (LCS) interfaces with the user’s WMS or ERP providing full system accountability and a high degree of management control. Integrated IT systems provide precise machine control and real-time visualisation capability, with a user-friendly interface displaying operating status and full service diagnostics. 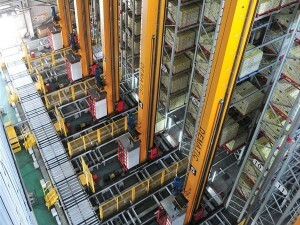 In conclusion, Dematic’s RapidStore Pallet ASRS brings a host of benefits to the table, including higher storage density, smaller building footprint, lower labour requirement, ability to run 24/7, enhanced safety, elimination of product damage, faster cycle times than turret trucks and reduced energy usage.